If you're looking for a great way to stream popular music from your desktop have I got the service for you! It offers no restrictions of any kind, it's totally free, doesn't have ads (at least that I've heard), has one of the largest music libraries in the world, and you probably already have an account. The name of this magical unicorn? YouTube. No, I haven't found a way to get YouTube Music Key for free. What I'm talking about is a Chrome extension called Streamus that hooks into YouTube and offers as much music streaming as you can handle. Streamus doesn't play videos and doesn't require you to have a tab open. Instead, the extension just grabs the audio from the videos to let you listen to as much music as you want. If you ever do want to see the video, however, you can right-click any song to view it on Google's video site. There are some restrictions with Streamus, since you can't move the service from your PC to a mobile device and it mostly relies on creating playlists from scratch. Sound quality is also entirely dependent on what's available on YouTube. First, install Streamus from the Chrome Web Store. Once that's done you should see a new "S" icon in your Chrome taskbar. Click that icon and a dropdown menu appears with your first blank playlist, dubbed "Playlist 0000." Now it's time to start adding music. Click the search icon and start searching for your favorite tunes. Search results appear right below the text entry area. To select a song, hover over it with your mouse and then select one of three icons: play, add to current play queue, or save to a playlist. That's about all there is to adding music. 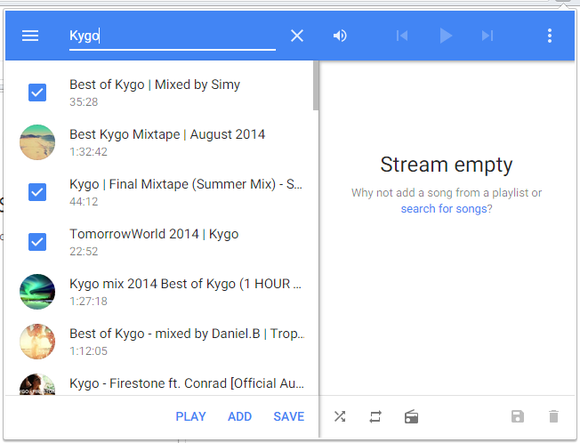 Unfortunately, Streamus doesn't appear to have a way to import ready-made playlists from Spotify or other sources so you'll have to create them all from scratch. 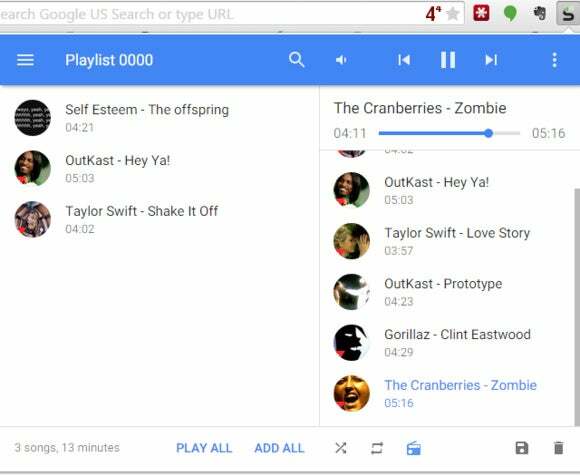 Anyone who isn't interested in creating an endless number of playlists can also rely on the extension's Pandora-like radio feature. At the bottom of the Streamus interface, just click the radio button and once you reach the end of the current play queue new songs will be added automatically. The radio feature isn't as robust as you'd find on Pandora or Spotify and tends to get stuck on playing songs from a single artist, but it is serviceable for getting that leanback music experience. If you're someone who needs a ton of features or expects a highly visual interface then Streamus won't be for you. But if all you want is music, more music, and a little more music while you work, then give Streamus a try.